I was responsible for the worker's safety, industrial product safety, accident prevention and loss control. Development of safety programs for many areas, for accident prevention, including trucking. 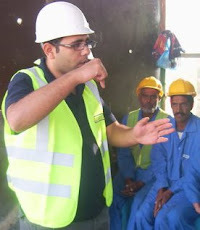 Broad-spectrum safety training and course development for supervisors and workers for different units. Research, communication, determines cause and suggests solutions . · Monitor the enforcement of safety issues at site and report immediately on any violation. · Check all safety activities at the site and follow up. · Safety tool box meeting. · Full protection around the site and follow up. · Full protection inside the site. · Daily report with pictures. · Check scaffolding and platforms and follow up. · Weekly, Monthly training for all the site personnel with pictures. · Daily, Weekly, Monthly reports. · Tool Box – Safety Talk Meetings. · Planning; Hazards identification, Risk assessment, Risk control, Prevent accidents, Shocks, Fires, Burns, Explosions, Save lives and Properties. · Review and approve the sub contractors' safe working procedures. · Vigil of factory safety and security systems. · Be familiar with state and statutory legislation's safety rule and guide line. · Training at all levels – Staffs & Workers. · Guiding an advising site's personnel. · Emergency preparedness planning, Organize rescue and Fire evacuation drills. · Good experience in Fall Protection, Electrical Safety, lock out & tag-out, Scaffolding, Fire Protection and Prevention. · Learn and acquire new skills fast, and work well under pressure.  Ready to work in teamwork. § Excellent Knowledge of Office Package. § Very Good Knowledge of Internet. § Very good used Power Point.